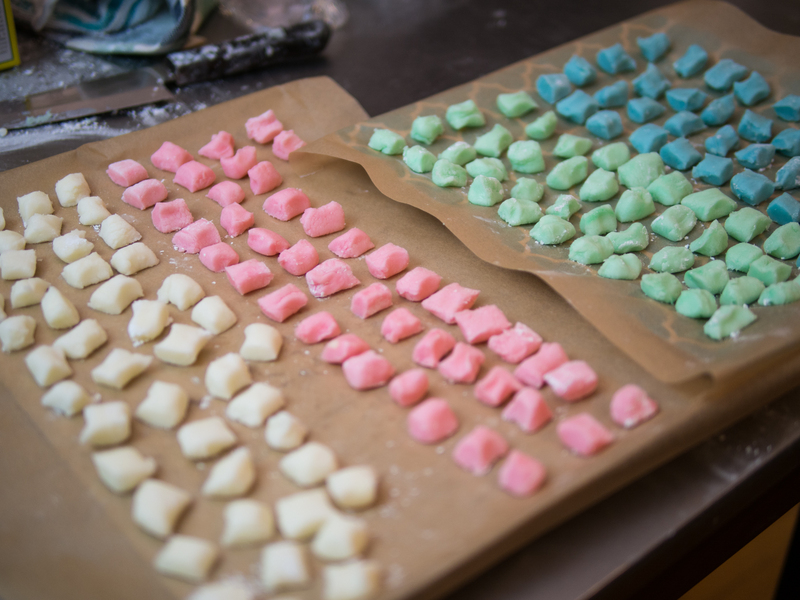 Candy-making! An ideal Sunday evening post-salsa-rehearsal, post-Ramen-consumption, pre-Arrested-Development-and-popcorn-binge activity. We meant to send some to Daniel’s brother and sister-in-law, who just had a baby (CONGRATS! ), but then we sorta ate them. Oops. 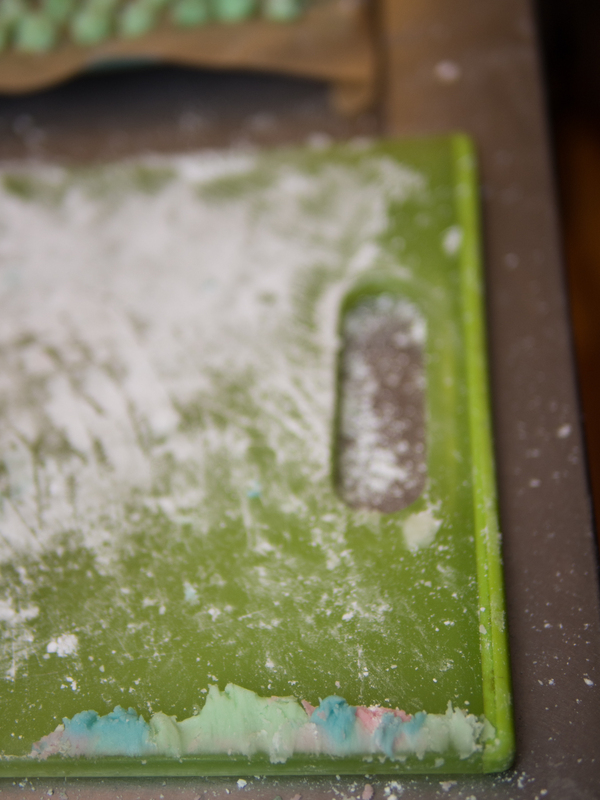 This was a bit of a messy process (UNDERSTATEMENT), as the powdered sugar literally coated every surface of the apartment at the first beater rotation. Next time I would start with softer butter and add the powdered sugar one cup at a time. 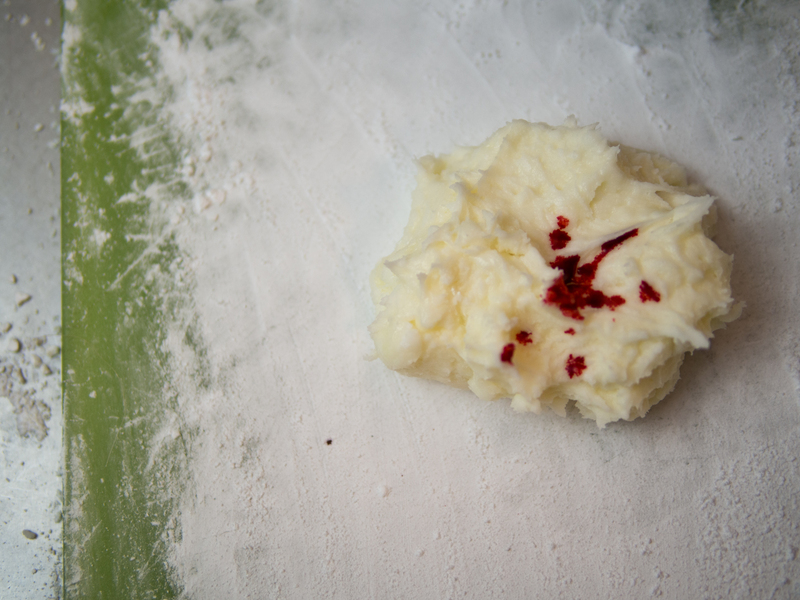 (And oh my, I just looked at their website and this is exactly what they suggest on their “Cookbook Corrections” page. I’m probably a candy genius.) But the messiness is worth it! 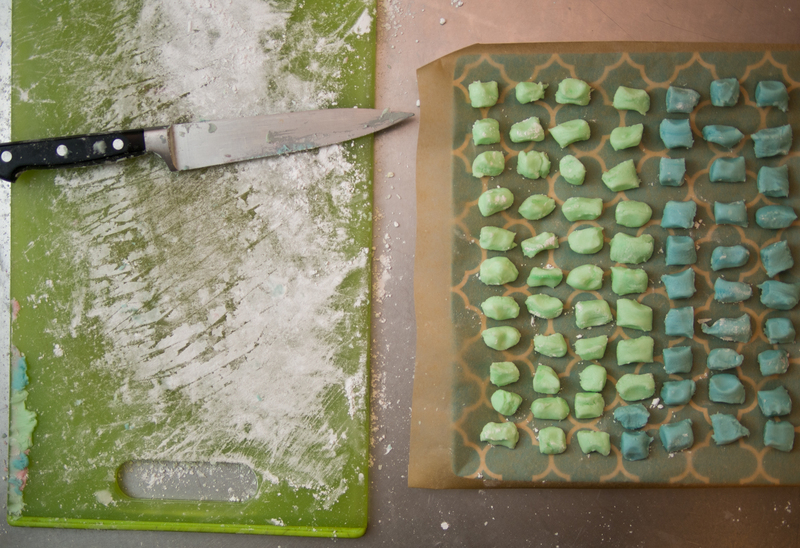 These things are just an excuse to eat minty frosting cubes. I’ll let the pictures now speak for themselves. 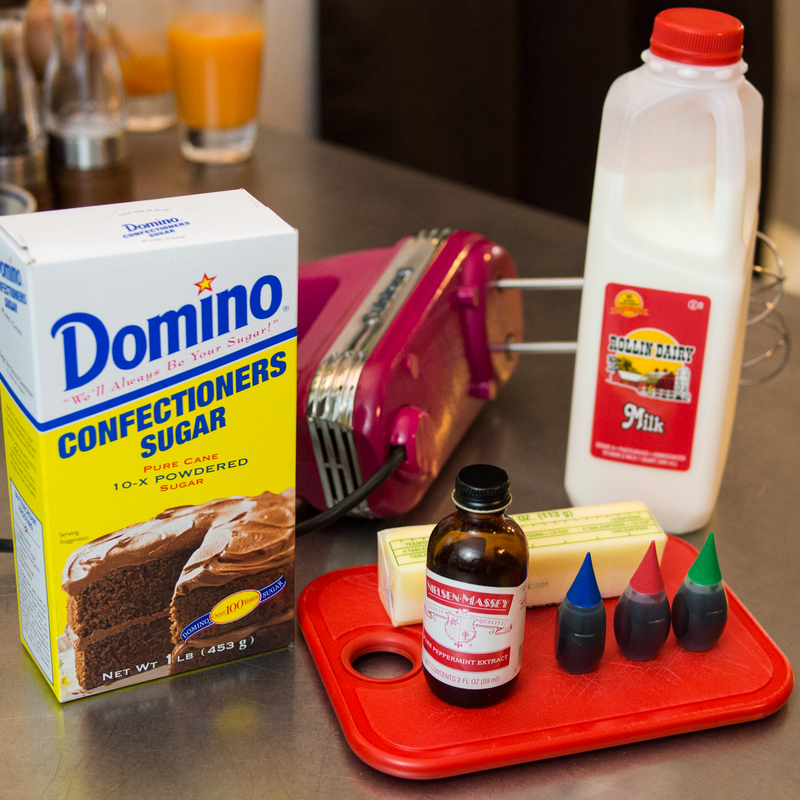 Add 2 T milk and peppermint extract and continue mixing on medium-high speed until big clumps form. 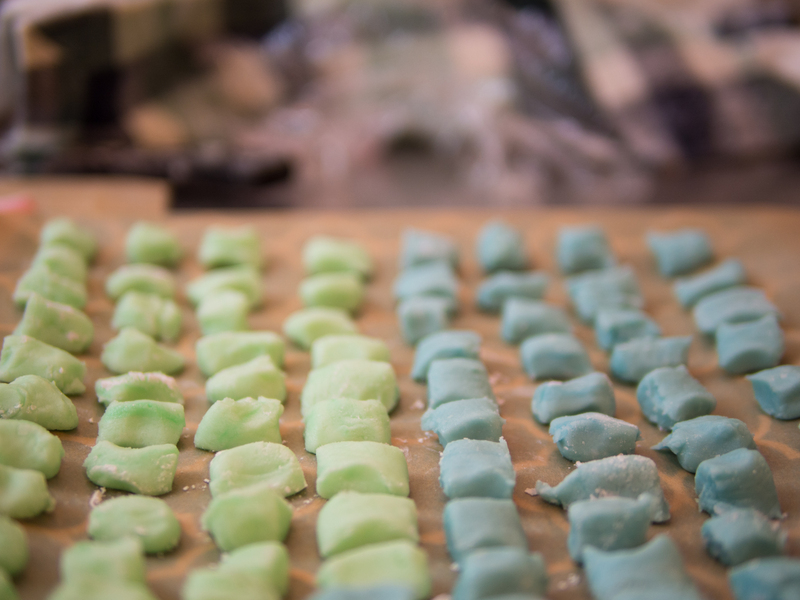 (If necessary, add 3rd T of milk, but keep in mind it will take longer for mints to dry this way!) 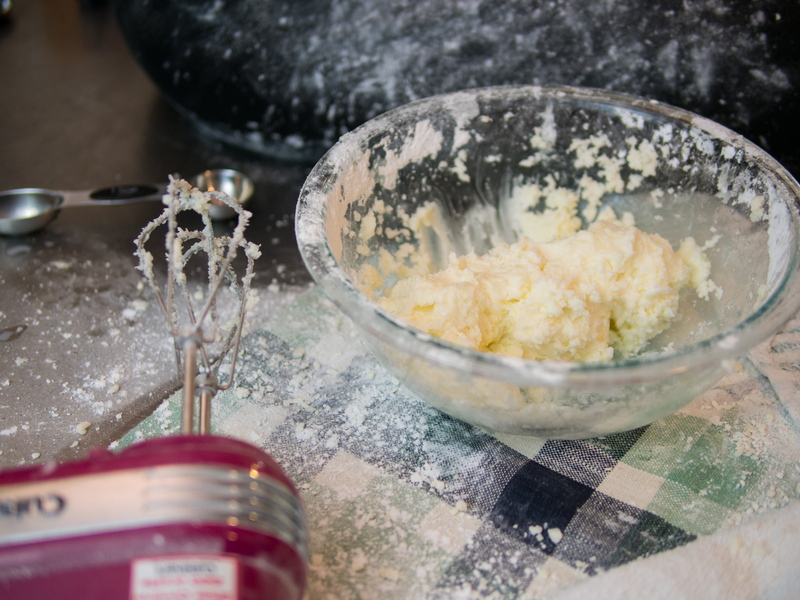 Keep mixing; mixture should soon form a loose dough. You can use your hands to help along this process. 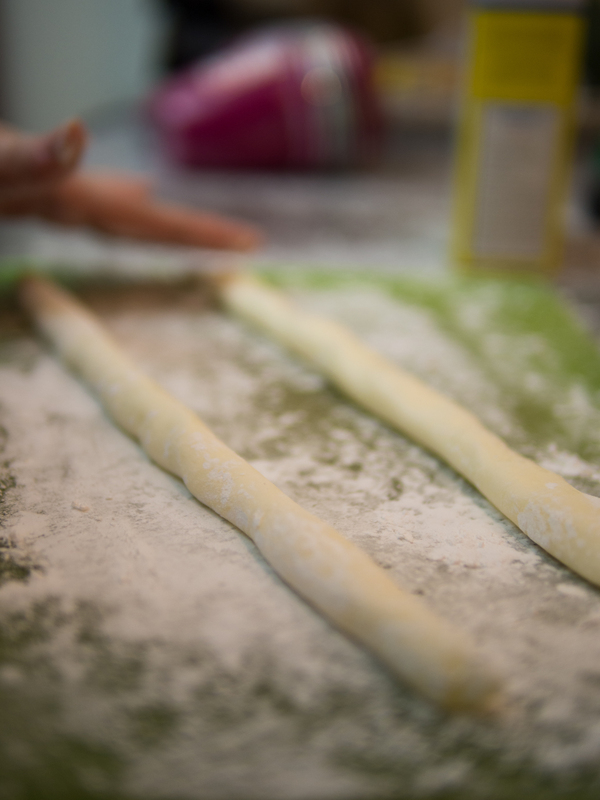 Divide dough into four parts. Cover each loosely with plastic wrap. 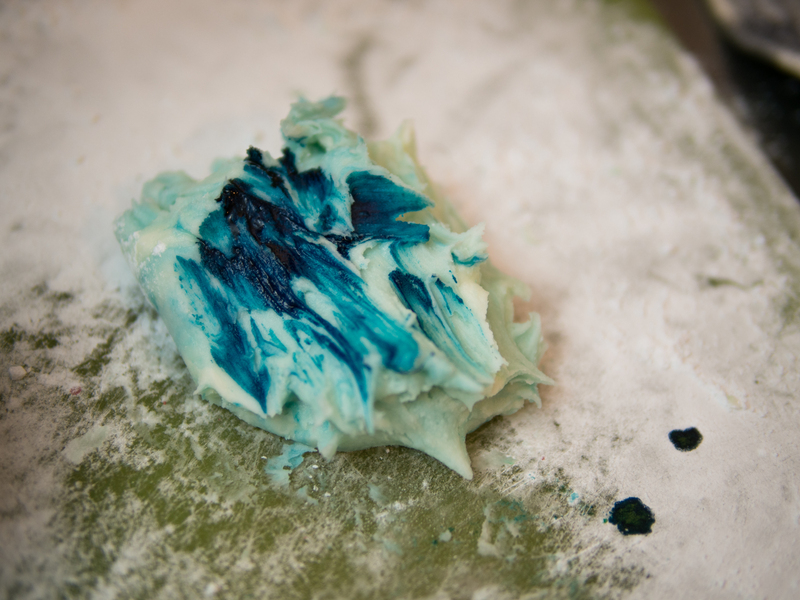 If you’re going to use food coloring, now is the time. 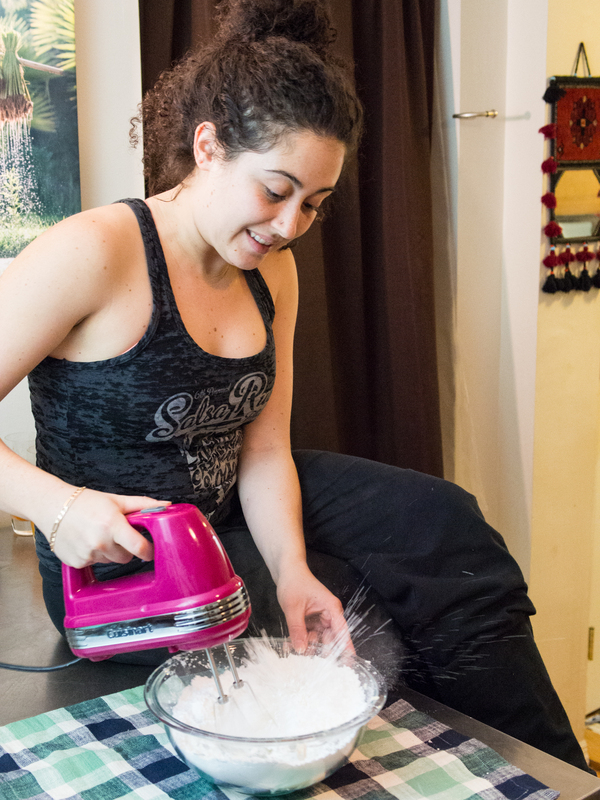 Take one dough segment and place it on a cutting board covered with powdered sugar. Coat your hands with the sugar as well. 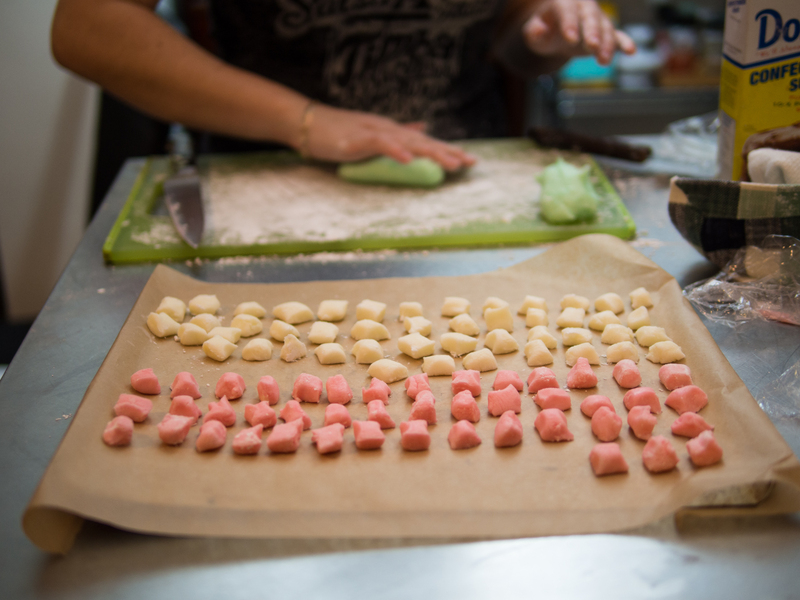 Add just 1 drop of dye to dough and knead it with your fingertips until the color is fully mixed in. Add more dye as necessary. 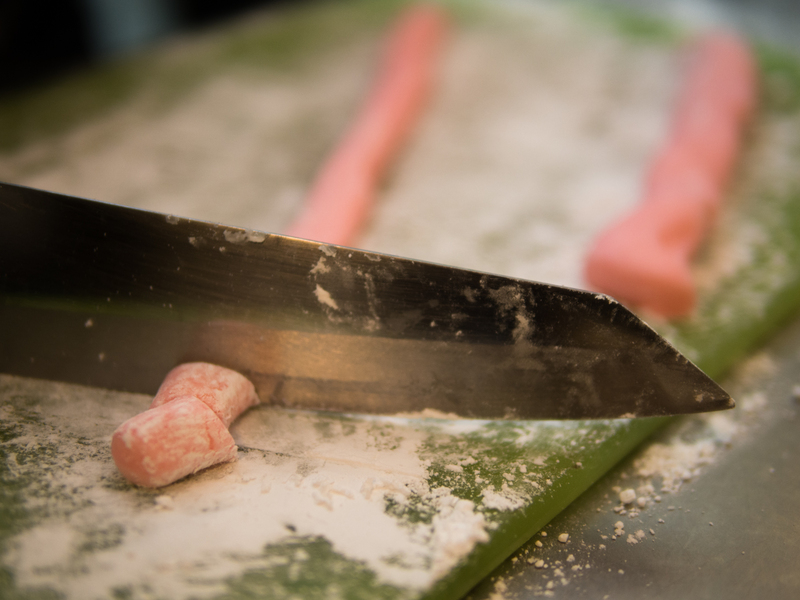 Then, keeping hands coated with powdered sugar, gently roll the dough into a log 1/4-inch thick. 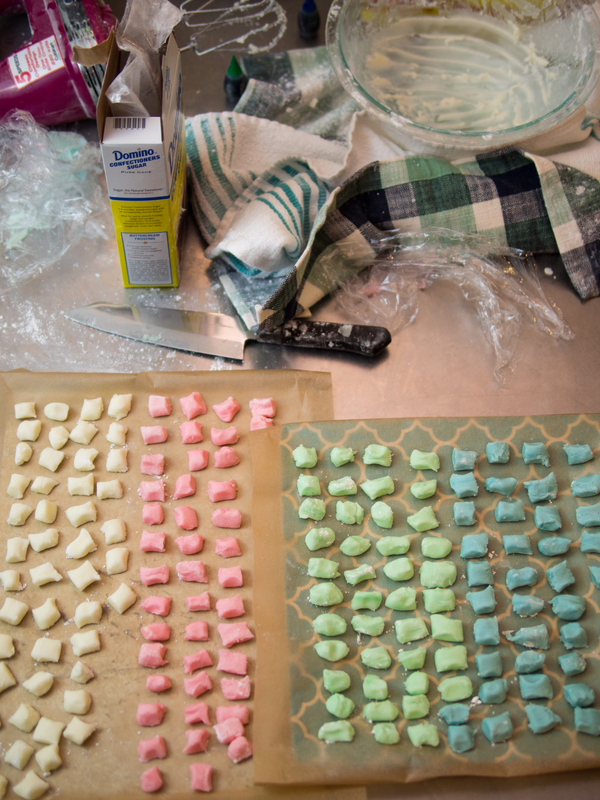 Using a very sharp knife, cut into 1/4-inch cubes and place on a cookie tray covered with parchment paper. Repeat this process for all 4 dough segments. Leave out to dry overnight, uncovered and unrefridgerated. Apparently these stay good for weeks. 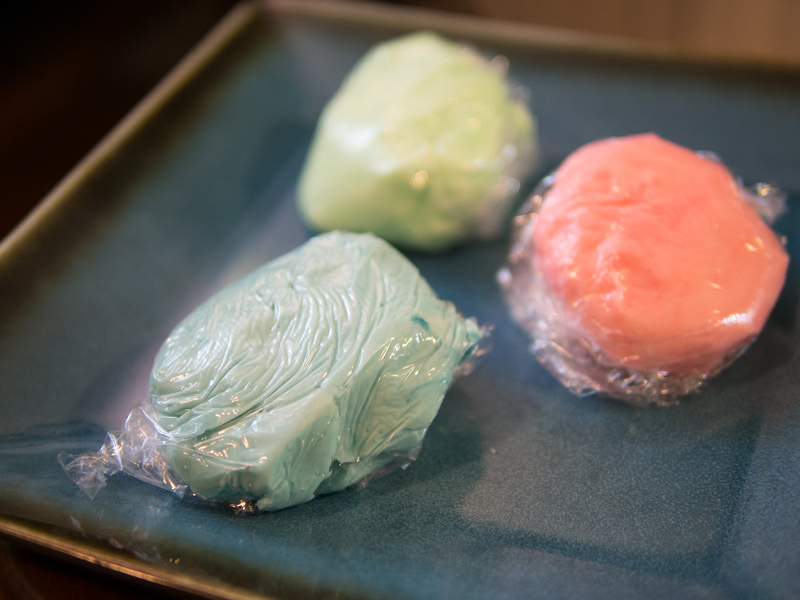 Keep in an airtight container, separated by layers of parchment paper, in a dry place (not the fridge!). This entry was tagged baby, baby shower, butter, buttermint, candy, dessert, fun, homemade, mints, no bake, powdered sugar, project. Bookmark the permalink. Thanks, Liz! Gold star is much appreciated 😉 And a million thanks to you for the fun and delicious recipe! Yum! I’m definitely trying these out for holiday parties. A fabulous idea you won’t regret, Leah! Make sure to wear a (cute) apron!